They were set up by activists to protest racial injustice in the province. Chris Blondeau-Perry, left, an 88-year-old Metis woman from Weyburn, Sask., and Prescott Demas, second from left, both supporters of the "Justice For Our Stolen Children" camp near the Saskatchewan Legislature Building in Regina on June 12, 2018. 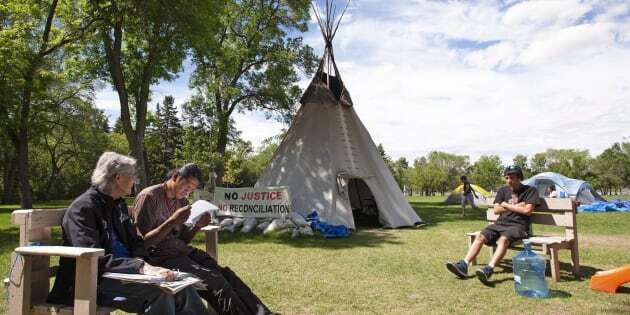 REGINA — Saskatchewan's premier says the Regina police should remove teepees that protesters have set up on the legislature grounds. Scott Moe says there are laws that cover the park surrounding the provincial legislature to ensure that it's available to everyone. The police have said they don't see the need to step in at this point, noting there a meeting scheduled for Monday between the protesters and the government.